I live far enough from the SJC airport to not be disturbed by airplanes, yet close enough to get there fast (7 minutes on the 101). But no one told me when I rented the place I'd hear the traffic from Moffet Field. Moffet Field belonged to the US Navy and is now owned by NASA. Once in a while odd planes fly over my house to land in the field. By odd I mean: experimental fighters, World War II bombers, helicopters and I even saw a Comanche (no, not a flying Indian - it's an experimental attack helicopter - see image below). 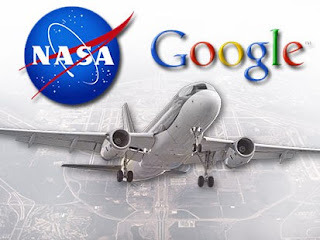 have negotiated with NASA to let them land their 767 Googlejet at Moffet Field (which is close to the Googleplex). Why?! Why do I need a landing flying over me every time Larry feels like a Philly Cheesestake (in Philly)??? ?